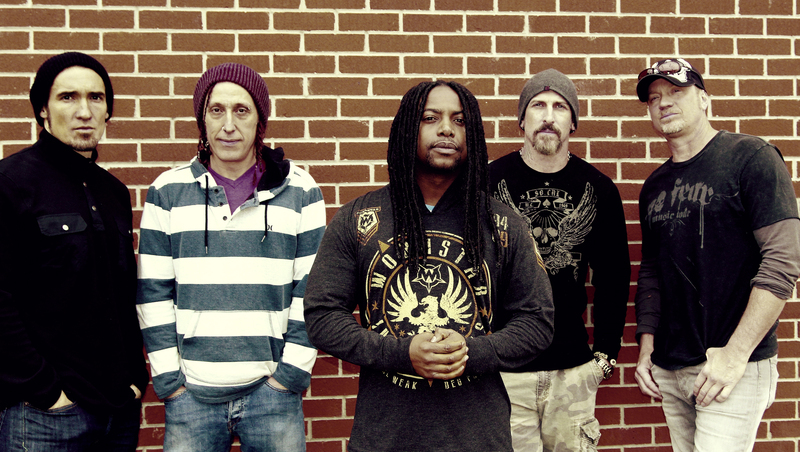 Sevendust may be on an acoustic tour, but that doesn't mean the band has stopped rocking. "I got a stool up there, but after three minutes I'm up walking," singer Lajon Witherspoon told CBS News, adding, "We brought out a keyboard piano player that makes everything sound even prettier. It's not a run-of-the-mill acoustic show...It has a real cool vibe. I feel like we paint a really pretty picture of music." The Atlanta hard rock band has been on the road behind its new album, "Time Travelers & Bonfires," an acoustic collection that features new songs and seven re-recorded tracks from Sevendust's repertoire, including "Black," "Gone," "Denial" and "Karma." "It was something that we've been thinking about," Witherspoon said. "For the last few years a lot of people asked us to do an acoustic album." This isn't Sevendust's first foray into the acoustic scene. In 2004, the group released the live acoustic album, "Southside Double-Wide." But the new set does mark Sevendust's first time using a direct-to-fan campaign to raise funds. "You can tell when you see the people in the crowd -- they know they're a part of it. And that's cool," said Witherspoon. While recording the songs, Sevendust even invited fans to FaceTime with band members in the studio. "So you think about seeing somebody from Australia on FaceTime while I'm doing vocals and they're like, 'My God, I can't believe it.' And I'm like, 'I can't believe it either!" "For us, it was more hands-on...It made the album even more special," Witherspoon added, noting how the stripped-down vibe puts his vocals "under a microscope." When it came time to compose the material, the members of Sevendust do what they always do with their music: write from the heart. "We write about things that happen to us and affect us because we aren't any different from anyone else," said Witherspoon. "We go through the same things everyone else goes through. And that's what our songs are about. We just try to put out something that makes you feel better and the kind of experience you've been through -- that's what we try to do." Now it's a matter of perfecting the songs in concert: "We got to nail it down and getting it to the perfect way you want to do it." Witherspoon has been soaking in music for as long as he can remember, listening to Earth Wind & Fire and the Eagles while growing up in Atlanta. "My dad was in a disco band so music was always around," he said. "Then I would go to the country -- we had horses in Murfreesboro, Tenn., and the kids would think I was weird because I would come back singing country songs after the summer. And I'm in rock and roll business, so at least I did something with it." Today he loves old R&B, but says he listens to a wide variety of music. "In the dressing room it could be Thin Lizzy or a Britney Spears song, Stevie Wonder...It's everything. There's nothing that I don't listen to...rap, country." Witherspoon and his bandmates Clint Lowery (lead guitar), John Connolly (rhythm guitar), Vince Hornsby (bass) and Morgan Rose (drums) have been at this for a while now, having formed in 1994 before releasing their self-titled debut album three years later. "I've always felt like I was destined to do this," Witherspoon said. "We're a bunch of men who have grown up...to having families and kids...Twenty years ago feels like the other day when I said, 'You know what? Our kids are going to be playing together.' And sure enough our kids play together. They hang out and talk on the phone. It's crazy to see." Sevendust will be on the road for most of this year, playing clubs and festivals -- and probably doing some writing in between. "We're definitely playing around with things. We're always writing," he said. "But I think we're going take our time, take a break and unplug before we even start talking about that [new album] again because we've been doing it for so long."